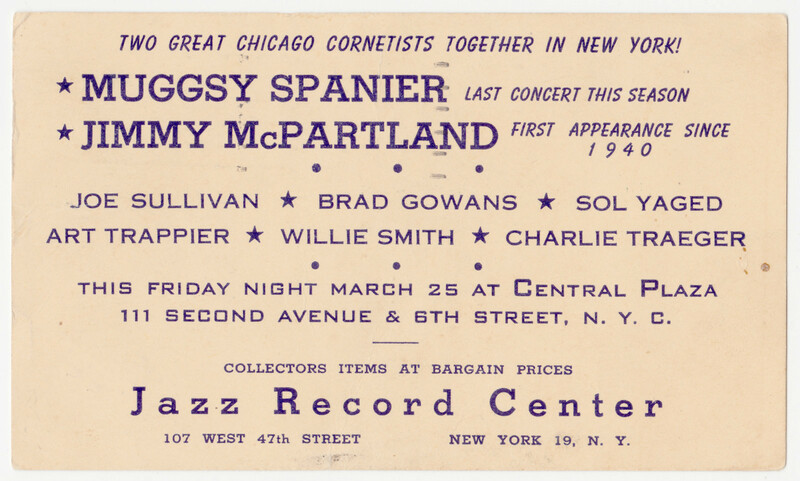 I was one of the steady jazz loving week-end customers at the Central Plaza and Stuyvesant Casino from around 1950 to 1952 and got these post cards weekly. This is the only one I kept. I started when I was still in Erasmus Hall H.S. (they didn’t card in those days). 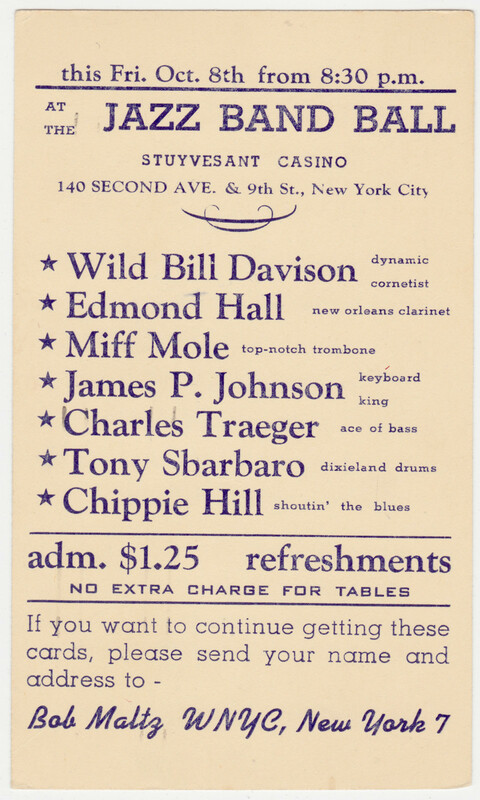 My favorites were Bechet & Wild Bill but I loved them all. 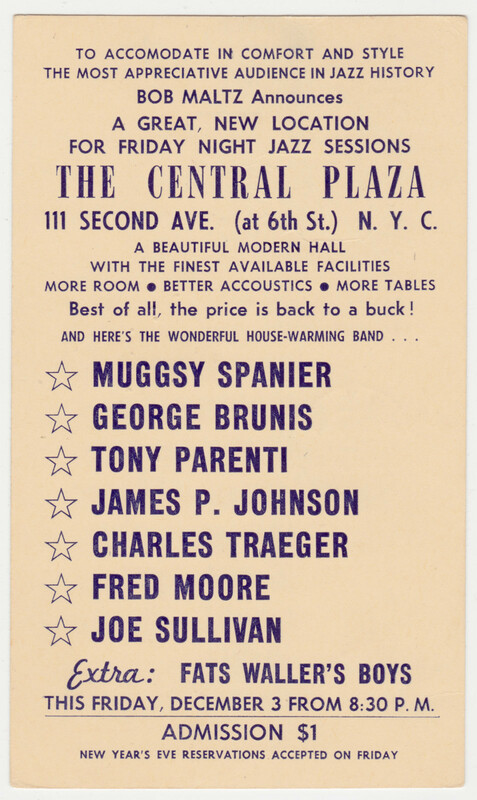 Among my memories: I helped Pops Foster put his bass in a cab one night and we went to the Riviera on Sheridan Sq., Red Allen pulled me up on stage once and we sang “The Saints Go Marching In” together. I became friendly with Baby Dodds and invited him over for dinner one evening to our apartment in Brooklyn. I also visited his place in Harlem. I have a Xmas card he sent me, written, I think, by his lady friend as I don’t think he could write. My personal Louis Armstrong stories are even better! (at least to me). He was a wonderful guy. First time I met him was Xmas time 1949. I had just bought a Louie 78 at Big Joe’s record store on W.46th St. I’m walking down B’way and I’m shocked to see Louie walking up B’way. I remember shouting “Satchmo” and the 2 of us walked, with our arms around each other, uptown to the Capitol Theatre where he was playing. I was so excited, I almost broke my record showing it to him. He invited me to visit him in his dressing room someday. A few days later, with a friend of mine, we bought tickets for a matinee show at the Capitol (75 cents?). I remember that, besides Louie and his group, Jerry Lewis’s father performed some comic stuff. Anyway, after the show, we went to the stage door and I told the door man that Louie invited me to come up. He phoned up to his room, got the OK and up we went. Louie was resting in a cot and the first thing I noticed was the Star of David hanging from his neck and thought, can’t be, he can’t be Jewish! I have no idea what we said but, coming from school, I had my note book which had his picture pasted on the inside cover. He signed it (green ink) and it hangs on my wall today along with a second one he signed at another time. The second time was my graduation night from H.S. We were having a marshmallow roast on the beach at Coney Island when I remember saying, “Satchmo’s playing at Bop City. Let’s go.” About 5 or 6 of us took the subway and ended up at Bop City on, I believe, 47th and B’way. I told Louie who we were and he made an announcement, the exact words I still remember: “There’s a buncha kids just graduated from Erasmus High School and I’d like to dedicate my next number to them.” He put his horn to his lips and blew Auld Lang Syne ending by skat singing,”old acquaintance, be forgot baba ba doo zip, yeah” all the time looking at me (us). A great musician and a warm wonderful person. Louis, as we know, remains a warm wonderful person. But right next to him is Mr. Arnold, so generous to us all. There was Chicago’s South Side in the mid-to-late Twenties. There was Fifty-Second Street in New York for a decade starting in 1935 or so. There was always Harlem and Kansas City . . . but these three advertisements speak to me of a Golden Age that was happening before I was born. Let’s get prepared. We need some money, acetates for my Presto disc cutter, several cameras, rare Okehs and Paramounts for everyone’s autograph . . . and be sure to let your parents know we won’t be home early. All set? The Beloved has her back cushion. We’re all set! We’ll swing by Emily’s house to pick her up: Eric, Noya, Jon-Erik, Matt, and Kevin are meeting us there. If anyone tends to get carsick, they have to come by subway. Gordon, Veronica, Lena, and Tamar promised they’d come. Enough fantasy, perhaps. All I know is that one of these evenings would have changed my life. Posted in "Thanks A Million", Bliss!, Hotter Than That, Ideal Places, Irreplaceable, Jazz Titans, Mmmmmmmmmmmmm!, Pay Attention!, Swing You Cats!, The Real Thing, The Things We Love, Wow!